The pressure in athletics to achieve one's highest level of performance has never been higher. Training programs, rehab, supplementation, and lab work have been some of the main areas of focus to help with improving athletic performance. An often overlooked area that contributes not only to sports performance but also to the prevention and treatment of athletic injuries is nutrition. In sports where caloric intake is closely monitored for either performance standards, physical appearance or a combination of both a lack of adequate caloric intake can become a predisposition for injury and decreased performance. Now, where the confusion and discussion can start. Caloric deficit is not just in the short term of not eating well for the past day or two or even in the mid-term when we look at a week(s) and even up to a month. Where caloric deficit can have major impacts is over the long-term and consistently hitting caloric deficits week after week. This condition is known as Athletic Energy Deficit (AED). It has been found that long term caloric restrictions can cause a decrease in resting metabolic rate and then increase the amount of fat stored within the body. It is actually possible (although hard to believe) that higher caloric consumption along with that high activity can lead you to lower body fat. As AED becomes more severe it's impact is seen especially in women as the body starts to responds by suppressing basic physiological functions that essential to body function including immune function and bone health (to name a few). 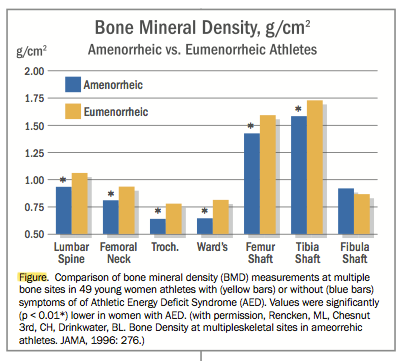 See the figure to the side to look at the bone mineral density of commonly injured bones in amenorrheic vs. eumenorrheic athletes. A common area of energy deficiency in long-distrance/endurance athletes is dietary protein. A common thought is diets high in protein lead to building muscle mass and recommendations for strength/power athletes are often 1-2g of protein per kilogram of body weight or even pound of body weight. This recommendation should also apply to all endurance athletes with the understanding that they won't building substantial muscle mass and that that level of protein intake is especially important for repairing muscle damage and for the synthesis of functional body protein like enzymes that help with all other body processing including fat utilization which is important for the endurance athlete. Carbohydrate (CHO) intake is also important for the recovery of muscle glycogen (an essential form of energy for life and exercise) and it is recommended that an intake of 7-10 g/kg for prolonged activity and at minimum 10g/kg in recovery after strenuous activity. Depletions of all this nutrients lead to prolonged breakdown of vital functions within the body and the eventual breakdown of body minerals, in particular bone. I'm not saying that not eating enough on any given day is going to make you more injury prone than the next, although it can impact your workout leading to possible increase risk on injury. What seems to be the major problem is a caloric deficit not only over a week, two weeks or even a month but over the long term of a season, or semester and even a year. People have had issues with weight gain and fat increase and decreases in performance when their mileage has never been higher and it appears to make no sense. This is where nutrition can be a major contributor to your performance and I believe is often over looked or a deficiency here is blamed on low iron, thyroid disease or another dysfunction. Take control of the easy things you can controls and take your nutritional/caloric intake in a good range for what your body needs and many fatigue and performance issues can be resolved.